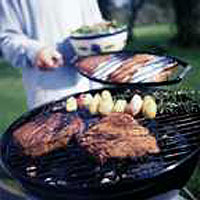 For a medium cook, place on a preheated barbecue for 8-10 minutes, turning occasionally. Alternatively, cook on a lightly greased griddle pan or under a preheated grill for 8-10 minutes. Serve with Herby Potato and Shallot Kebabs. Allow 3 shallots and 6 small new potatoes per person. Cook the potatoes in plenty of boiling salted water until just tender. Peel the shallots, brush with oil and sprinkle with a little icing sugar. Thread the prepared vegetables onto skewers or rosemary stalks. Brush with a mixture of softened butter, freshly chopped herbs and sea salt. Cook on the barbecue or under a preheated grill for 10 minutes until golden.